West Bay, Dorset - History of the Harbour. The Doomsday Book appears to suggest that ownership of the West Bay area around the 11th Century was split between Symondsbury holding the west bank of the River Brit for the Abbey of Cerne and the Manor of Burton Bradstock holding the east bank for the Crown. However, medieval records indicate disputes over both beaches and harbour involving a third party upstream on the River Brit; the Borough of Bridport. 'Right of Wreck' was a contentious issue, the Abbot of Cerne and the Prior of Frampton (for Burton Bradstock) apparently often taking legal action against the 'Borough' for removing wrecks from the foreshore. In 1280, Bridport claimed all rights to sea wrecks on the beaches and then in 1288, claimed rights to 'Take tolls from all Ships'. Bridport was land-locked, the only access being along the River Brit. Records of the harbour can be traced back to the 13th Century when sluices first existed. 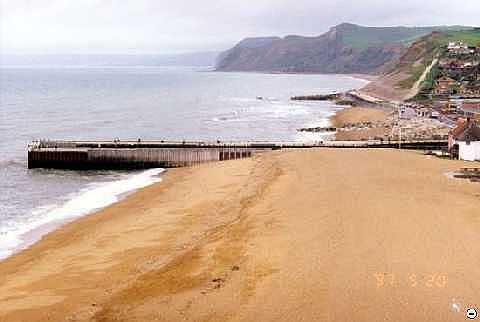 The area was then known as 'Bridport Mouth'. In the late 14th Century around 1385, a local merchant, John Huddersfield began the construction of a harbour or 'haven' under the instructions of King Richard II, paid for by a ½ penny levy for every horse-load of saleable goods imported or exported. This was extended for a further 3 years in 1388. While in 1392, The Patents Rolls records showed that a harbour had begun. By the mid 16th Century the estuary to Bridport Haven had deteriorated, was no longer considered navigable and would therefore be considered as a creek. In the 17th Century the first piers were constructed on a framework of stilts and the area took the name of 'Bridport Harbour'. In the 18th Century around 1721, a Royal Assent was obtained to repair the harbour, the introduction stating: 'that by reason of a great sickness which swept away the greatest part of the inhabitants and other accidents, the haven became neglected and choked with sand, the piers fell to ruin and that the town suffered in consequence.' In 1740, John Reynolds was commissioned to design a more permanent and longer pier entrance. The River Brit estuary was diverted from close to East Cliff to its present position. Sluices were also constructed and a shipbuilding yard was established. However, in 1744 a great storm caused considerable damage. In the 19th Century, following an Act of Parliament for the purchase of suitable land, a larger harbour basin was constructed at a cost of £24,000. Robust piers of a solid construction were built. In 1823, the harbour came under the control of the Commissioners with Bond being issued. Later that year, the Great Storm of 1824 caused considerable damage to the piers and harbour. In 1837, parish boundaries were changed. 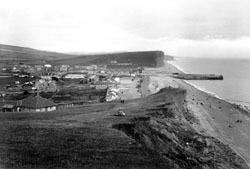 Bridport Municipal Borough Council was granted control of West Bay as far as the foot of east and west cliffs. 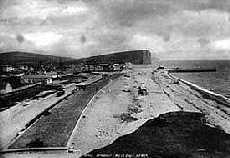 A strip of land from the east bank of the River Brit to just east of Harbour Road (now known as West Bay Road), linking Bridport to West Bay was also passed over at the expense of Burton Bradstock and Bothenhampton Parishes. Symondsbury and Burton Bradstock had previously shared parish control of Bridport Harbour (West Bay). In 1856, John Coode undertook extensive repairs and a rapid establishment in buildings, including Public Houses then took place. 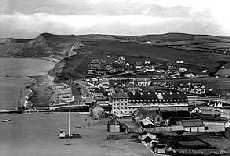 The majority of land in West Bay at that time was owned either by Lieutenant-General Augustus Pitt-Rivers (to the east) or Henry Edward Fox-Strangways, the 5th Earl of Ilchester (to the west). Together with other local entrepreneurs, they formed the West Bay Land & Building Company. 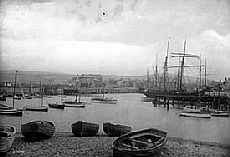 In 1884 the Bridport Railway was extended down to the harbour. 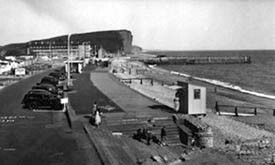 By now shipbuilding at the harbour was in sharp decline, so in an attempt to transform the area into a holiday resort, The Great Western Railway (GWR) decided to rename Bridport Harbour as ‘West Bay’. Some old 19th Century maps refer to the sea at Bridport Harbour as West Bay, so perhaps making the renaming of the area an obvious choice at the time. In 1885, Edward Schröder Prior built Pier Terrace (next to the harbour’s east pier) in an attempt to exploit the new holiday trade. In 1887 an Esplanade was built along the west beach’s seafront together with ‘The Mound’ by the harbour’s west pier. 20th Century. In 1901 a Pavilion was built upon The Mound and in 1916 the Esplanade was extended. In 1914, Giles Stephen Holland Fox-Strangways, the 6th Earl of Ilchester sold a 15 acre plot of land known as Watton Eweleaze, on West Cliff (Watton Cliff). The West Cliff Estate was formed and bungalows were built on the resulting plots of land. Long term battles took place between the elements and repairing of the harbour piers, Esplanade and The Mound. Alas, The Pavilion ultimately lost that battle in 1942 and had to be demolished following destructive gales! At auction in 1958 on 31st July and 1st August, Captain George Pitt-Rivers sold his ownership of land to the east of West Bay, including East Cliff, Haddon House, a Croquet Lawn opposite Haddon House, Swains Row, the Timber Yard, Allotments, West Dorset Golf Club, Freshwater Caravan Park and a large area of Burton Bradstock. In all, totalling 1,682 acres. In 1967, a new Promenade was constructed along west cliff and the seaward side of west cliff itself reshaped to reduce land slippage. 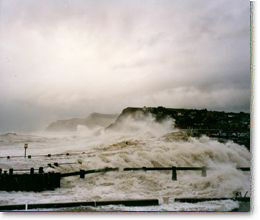 Severe flooding to West Bay took place in 1974 when the sea severely breached East Beach. 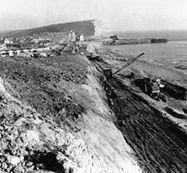 Various landslides took place on West Cliff, resulting in the installation of drainage in the 1970’s and further strengthening in the 1980’s together with extensive repair work to the Esplanade. 21st Century. A decision was made to spend £18 million to replace the West Pier, strengthen the existing East Pier and develop a new outer harbour with slipway. Due to the way prevailing wind and sea currents have changed over the centuries, the harbour entrance had been rendered unnavigable for almost 50% of the year. A new West Pier, named 'The Jurassic Pier', built on a different angle and of a ‘Banjo Pier’ configuration has addressed this issue. Extensive rock armouring has also been used to hopefully protect West Bay from serious damage and flooding in the future. New larger harbour constructed with solid entrance piers and River Brit diverted. 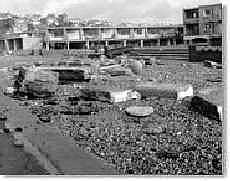 Later, the Great Storm destroyed piers and caused massive damage to harbour, properties and shipyard. Extensive repairs to the pier and harbour followed.